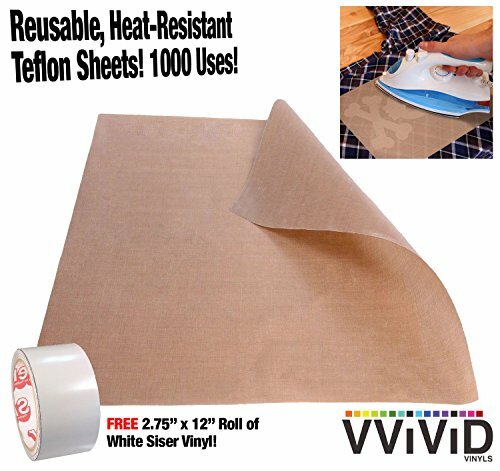 Tackle any task with VViViD Teflon Non-Stick Vinyl Crafting Sheet. These highly durable, PTFE coated fiberglass sheets are perfectly suited for a variety of tasks, from sewing/applique, heat pressing, stamping, ironing and baking to uses with metal, clay, polymer clay, HTV, wax and a lot more. These Craft Mats can also be used as a barbecue grill mat, nonstick oven liners, iron clothes protector, heat press transfers and other crafting projects. Each sheet can be used hundreds of times without issue, is completely food safe and wipes clean with just a damp cloth! Also get a free roll of Siser-brand White Heat-Transfer vinyl. Teflon sheets protect your vinyl, fabrics, iron and work surface while you iron-on HTV. Heat resistance up to 600 degrees. Perfect for Heat Press Machines! Perfect non-stick coating cleans in seconds with just a damp cloth. Wipe away paint, glue, food residue, wax, baked food, clay and more when finished. PTFE coated fibreglass sheets sheet has hundreds of uses in your home, office or kitchen. Use as a barbecue grill mat, nonstick oven liner, clothing iron protector, heat press transfer sheet or paint palette. Also includes a free, bonus 2.75" x 12" roll of White Siser HTV Vinyl!